In 1967 the Celtic Football Club made history: winning the European Cup was a vindication of the club’s philosophy of attacking football, a landmark for Scottish football and an inspiration to generations of players and supporters. Celtic: the Collector’s Edition takes Lisbon 1967 as the starting-point for a celebration of all things Celtic. A replica European Cup Final programme and ticket for the match against Inter Milan are major attractions for any fan or collector. The book looks back at the foundation of the club, its unique Irish-Scottish heritage and its intimate connection with the east end of Glasgow, where the new Celtic Park now stands like a beacon of sporting hope. This remarkable, five-kilogram coffee-table volume revisits the landmarks in Celtic’s history, presents the legendary players who have graced the green and white jersey, and pays stunning photographic tribute to their legacy. Privileged access behind the scenes brings new understanding of the all-round effort – the medical team, groundsmen, coaching staff and so many more – required to create a successful football club for the 21st century. 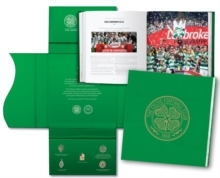 While the Lisbon Lions, fifty years on from their stunning success, are at its heart, Celtic: the Collector’s Edition showcases all of the club’s most significant triumphs at home and abroad. The volume is one of a collection called ‘The Icon Series’ which already includes ‘Arsenal: the Collector’s Edition’ and will be augmented by further additions midway through 2017.